At Rajprasong they are singing: "This is a class war to sweep away the autocracy". For months the streets of central Bangkok have been taken over by a mass protest movement organized by the UDD, the United Front for Democracy Against Dictatorship, commonly known as the Red Shirts. This mass movement of the poor and dispossessed has shaken the power structures of the ruling elite and threatens the future of the Thai monarchy itself. Many of them are supporters of the former prime minister, Thaksin Shinawatra, who was overthrown in a coup nearly four years ago. The prime minister, Abhisit Vejjajiva complains of “chaos” and “anarchy”, but he conveniently forgets that he came to power by similar means. His government was installed by the military, and is the product of a military coup in 2006 and various judicial coups. Between 2006 and 2008, and the yellow-shirted thugs of the Democrat Party boycotted elections that Thaksin Shinawatra was likely to win. This resulted in the annulment of the election. Then, when a military interregnum failed to keep Thaksin's supporters out of power, the monarchist, reactionary mobs blockaded government buildings and Bangkok's airport to provide the excuse for a coup. Abhisit’s seizure of power was the negation of democracy but it was conveniently ignored by the West. The demand for new elections is an elementary democratic demand. But it is not acceptable to the Thai oligarchy. The attitude of the so-called democrats in Washington and London to dictatorship is determined by their class interests. The Abhisit government represents the ruling oligarchy, the reactionary Thai monarchy and the military. That suited the West very well, as it appeared to offer solid guarantees for their investments in Thailand – one of the most important economies in Asia. Those same hypocrites enthusiastically backed the so-called Orange Revolution in the Ukraine, and constantly denounced the alleged “autocratic regime” of Hugo Chavez. But they have reacted to the democratic protest movement in Thailand with a deafening silence. The Red Shirts, a loose anti-government coalition, looked to Thaksin Shinawatra as a point of reference. A billionaire tycoon, Thaksin, now safely in exile in Montenegro, is an unlikely candidate for the leader of a revolution. Critics point to the violation of human rights under his government. But he also carried out a number of measures in the interests of the poor, especially the rural poor in the north of the country. Lacking a clear leadership, party or programme, the masses look towards individual leaders who seem to personify their aspirations. The poor farmers have a burning hatred for the wealthy urban ruling elite that dominates, exploits and oppresses them. The name of Thaksin acted as a rallying point for the opposition to the present regime, especially the poor peasants who derived some benefit from his rule. However, in reality, he is an accidental figure, like Father Gapon or Kerensky at different stages in the Russian Revolution. Certain middle-class, western intellectuals confess that they cannot understand why thousands of poor men and women can choose to fight and die on the streets of Bangkok for the cause of an exiled billionaire tycoon. Some have even characterized the movement as “fascist”. This shows a complete lack of understanding. By contrast, the excellent reports by Giles Ji Ungpakorn, a left-wing intellectual and dissidenter, exiled in London, have given a very accurate and truthful account of the movement. 15 May in Bangkok. The people who are fighting and dying on the streets of Bangkok are not doing so to support one ambitious bourgeois politician against another. They are fighting for a fundamental change in society. Maybe they do not know exactly what they want. But they know very well what they do not want. They do not want poverty, hunger and unemployment. They do not want the rule of a corrupt and reactionary oligarchy. And they do not want the Abhisit government. The demand for new elections therefore was a natural starting point for their protest. But once the masses had been set in motion, the movement acquired a new dynamic. The participation of workers, revolutionary youth and the urban poor has transformed the movement, which can not be described as a rabble of ignorant farmers, as the reactionaries try to portray them. In recent weeks the influence of Thaksin Shinawatra appears to have been pushed into the background. The oppressed workers and poor farmers are finding a voice and expressing deep-seated grievances, not just against the present government but against a society that is fundamentally unjust. That is why the masses have shown such tremendous revolutionary determination and willingness to fight and make sacrifices. However, the same determination is not being shown by the leaders. The leaders are not poor workers and peasants with nothing to lose but their lives, but middle-class intellectuals who want greater democracy and less military influence in the country’s political affairs. They are leaning on the mass movement in order to put pressure on the government to make concessions. They constantly appeal for negotiations. But they have set in motion forces that they can only control with great difficulty. The mass movement now has a life of its own. The protesters soon acquired a sense of their own power. Despite its lack of a clear programme (or maybe because of it), the movement attracted to its banner all the oppressed and exploited sections of Thai society. The determination and militancy of the protesters has grown, and with it, a desire for a radical change in society that goes far beyond a mere change of prime minister. This is now a struggle between rich and poor – a struggle between the classes. The oligarchy rightly fears the forces that have been set in motion by the pro-democracy movement, which has attracted to its side the workers, the youth, the peasants and the poor and oppressed layers of town and countryside: in a word, all the living forces of Thai society. Against them was ranged all that was corrupt, degenerate, outmoded and reactionary. This is a struggle between rich and poor, between the haves and haves-not. The Red Shirts are described as a “pro-democracy” movement, and in one sense that is true. There is a burning desire for democracy, which is expressed in a fierce hatred of the Ahbisit regime. Beginning with democratic demands, they will begin to relate political injustice with social injustice: indeed, for the workers and peasants the two things are inseparable. This may have begun as the struggle between two groups of rival politicians, but it has now been filled with revolutionary class content. Once they were brought to their feet, the masses inevitably began to express their own demands. The immediate tasks of the revolution (for that is what it is) are democratic in character. But the fight for democracy, if it is to succeed, must lead to the sweeping away of the entire existing edifice of Thai political life. The fight for democracy is identified in the eyes of the masses with a far broader fight for social justice and equality. That is understood by the reactionaries and the most determined elements in the protest movement. As usual, in the middle there are some who imagine that everything can be settled peacefully, through negotiation and deals. But this is impossible. There is no room in this situation for compromise, and the “centre”, as happens so often in history, will be swept to one side by the rising tide of class struggle. The movement can only succeed if it is led by the most determined elements: men and women who are prepared to fight to the end, as courageous men and women are fighting for their rights on the streets of Bangkok. Photo by Ratchaprasong. The government first attempted to defuse the situation by offering concessions. Abhisit held out the olive branch of early elections in November as part of a deal to end the confrontation. It seemed that some protest leaders were ready to go home on the strength of these promises. But for the majority of protestors this was a case of too little and too late. They demanded a fixed date for the dissolution of parliament and said they would continue their protests. The government deliberately exaggerated the violence of the Red Shirts' burning tyres and home-made rockets, repeatedly referring to them as ''terrorists'' preparing an armed rebellion, in order to justify the army’s deadly use of snipers and eventual crushing of the protest. The first test of strength came on 10 April, when 25 people were killed and hundreds injured on when troops tried to clear protesters in Bangkok. On that occasion, several soldiers were among the dead, apparently at the hands of black-clad gunmen with army-issue weapons. The bloody crackdown on 10 April 2010 showed the lying hypocrisy behind Abhisit’s “road map” for reconciliation. He had no intention of restoring democracy in Thailand. There were only two outcomes possible: either the masses would sweep away this government – and the reactionary monarchy that lies behind it – or military reaction would restore “order” with bullets and bayonets. The prosperous middle class of Bangkok fumed at the disruption of their lives, the occupation of their streets and the disruption of their luxurious shopping malls. The royalist yellow-Shirts were threatening to resume their protest and support the use of repressive laws and violence against the mass movement. The prospect of a bloody denouement was clear to all. Foreign embassies closed their doors, and several countries, including the United States, warned citizens not to travel to Bangkok. The Department of Foreign Affairs advised people to reconsider travel to anywhere in Thailand because of ''widening political unrest and civil disorder occurring in Bangkok and other parts of the country''. All this indicated that the Thai army was planning to begin a final offensive. Yet the government forces remained indecisive. The army avoided a frontal assault and tried instead to slowly strangle the Red Shirts' central city protest site. The army put up barricades and strung razor wire across all roads leading to the protest camp, blocking supplies and leaving few ways in and out. They declared two parts of the city, at Din Daeng and Bon Kai, “live-fire zones”. Senior generals threatened that anybody walking into those zones would be shot on sight. The response of the Red Shirts was to extend the territory they control across the city, hastily constructing new barricades made from tyres and car parts, and where threatened, setting them on fire. Several houses were also burned, and there were reports closed businesses and buildings in the no-man's land between the Red Shirts and the army were being attacked. The class struggle in Thailand has now reached an unprecedented fever-pitch. With adequate leadership, the mass movement could have overthrown oligarchic rule. The regime could feel the ground shaking under its feet. On the one hand the revolutionary mass movement was growing by the hour, on the other hand, there are clearly divisions in the army and the police. There have been many reports of fraternisation or even of demonstrators overrunning army barracks. Unfortunately the leaders of the protest vacillated and showed that they were not prepared to go to the end. This enabled the counter-revolutionaries to re-take the initiative. The army was clearly afraid of a direct clash with the Red Shirts. The proof of this is that, until this morning, they had not taken any territory from them, but instead tried to strangle the protesters by cutting off the supply of food and water, and cutting power and communications to their camp. But this was not enough to end the protest. Sooner or later they had to launch a final, violent, push to remove them. But there was a problem. Ordinary conscript soldiers are always reluctant to shoot unarmed civilians. That is a hundred times more true of a conscript army, many of whom are themselves from poor peasant families. The officers therefore used selected snipers hiding in the tower blocks to shoot demonstrators. One of the victims was Khattiya Sawasdipol, a former general of the Thai army who became the chief of the Red Shirt militia. He vigorously opposed the “peace deal” that left Abhisit in power. On the night of May 13th, a sniper’s bullet cut him down. He died in hospital. The army denies involvement, but nobody believes it. Still the Red Shirts stood their ground with admirable courage, although the army was now firing live rounds, leaving scores of people dead and injured. The cold-blooded murder of Khattiya Sawasdipol enraged his supporters and sparked off the new wave of fighting around the protest site’s perimeter, which spread elsewhere. 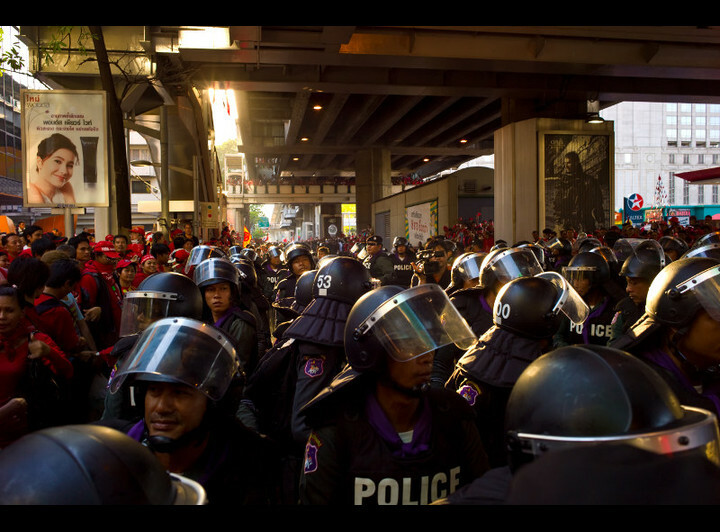 Whole districts of Bangkok were shut down, and the unrest was gathering strength away from Thailand’s capital. A state of emergency was declared in five provinces on Saturday, bringing the total to 22: nearly a third of the country. "Red Shirts have captured some soldiers who tried to sneak into the protest at Rajprasong. It is thought that they had orders to shoot the Red Shirt leaders. The prisoners are being treated well." The government announced a curfew. This brought a wave of anger from demonstrators. However, the army later backed down on the proposal, saying it was “unnecessary”. It was clear that the army and the government were still hesitating before striking the fatal blow. We also know that this hesitation was not dictated by sentimental or humanitarian considerations but by fear. This was a situation that could not be maintained. On the one hand the government had lost control of the streets and had lost its nerve. On the other hand, the leaders of the Red Shirts could not summon up the courage to call a general strike and move to take power. The lack of decisive initiative on the part of the leaders of the protest enabled Abhisit to recover his nerve. In the end, the government, pressed by the reactionaries, decided to go onto the offensive. Abhisit repeated his determination to end the protests and gave warning that losses “will have to be endured”. This meant that a green light was being given for a crackdown by the army – irrespective of the loss of life. The army encircled the site. Demonstrators were being urged to leave, with priority given to women, children and the elderly. Those that stayed faced an uncertain fate. The situation of the protesters was very difficult. Supplies of food and water were running low, and Red Shirt reinforcements were being prevented from joining the protests. The army had a clear advantage in terms of superior weaponry and discipline. But the masses had an even more serious weapon: their willingness to die. This steely determination unnerved the ordinary Thai soldiers and made them hesitant and reluctant fighters. On 13 May the government launched an attack on the Red Shirt protesters. In the beginning they were cautious, nervous about the outcome and doubtful about the loyalty of the troops. Western journalists reported that the soldiers seemed nervous, even frightened. They fired into the air and threw tear gas bombs. The Red Shirts were not intimidated, but replied by building barricades, throwing stones and lumps of concrete, firing slings and home-made rockets and Molotov cocktails. The big question was: what would be the result of an open clash? From a military point of view, the question answered itself. There was no way that improvised barricades and homemade rockets could stand against the discipline and firepower of a modern army. But this is not a purely military question. In the first place, behind the tanks and guns stand men, who can be powerfully influenced by the sight of a people that has risen. The cohesion of the army itself is not something that can be taken for granted. Unfortunately, the leaders of the protests had no real perspective. They called for UN-brokered talks. This had no chance of success. In the war between rich and poor there can be no referees or arbiters. There are no rules in this game. The only rule is that, in the end, one class must win and the other class must lose. The government has rejected all offers of negotiation, saying that talks would only begin when the protesters abandoned their barricaded camp in Bangkok. On Sunday, the Thai government rejected the call by the Red Shirts for a ceasefire and UN-moderated talks. For its part, the United Nations has not even responded to this request. "As long as the Red Shirt protest continues, armed terrorists will remain and hurt people and authorities. Risks and violence will escalate. I insist that ending the protest is the only way to prevent losses. "We cannot allow unlawful elements to take Bangkok hostage. We will not allow an armed group unhappy with the government to attack and hurt authorities. There is no turning back in our efforts to maintain a legal state. Losses will have to be endured. It is the only way to righteousness." The government was playing games with the protesters’ leaders, appearing to offer concessions while systematically preparing for a bloody showdown. In order to distract public and international attention from these plans, Abhisit offered new elections – but only in November, and on condition that the mass protest ended. Even if the November election was held, why should one expect that the royalists would not overturn an unwelcome result, either by more street politics or by corrupt judges? Sensing a trap, the Red Shirt leaders prevaricated. The Prime Minister immediately declared that his offer had been rejected, withdrew the ''road map'' to elections, and called in the army, which he had been intending to do all along. “But on the streets, there is fear. Fear is in the eyes of the Red Shirts' guards standing defiantly, but nervously, at the fortified entrance to the camp. “Full of bravado, Annan demonstrates his slingshot, pulling the rubber back and forth, aimed at a sniper, real or imaginary, in a nearby building. At his feet is a pile of rocks and lumps of concrete to hurl at oncoming troops. In his back pocket is a homemade rocket launcher fashioned from bamboo and scrap metal, to shoot fireworks at soldiers and police helicopters. They are a feeble riposte to the rifles and M-16s of the soldiers crouched behind sandbags and razor wire a few hundred metres away. “The barricade behind which Annan stands, built up over weeks of protest, is a enormous wall of tyres and sharpened bamboo staves, four metres high. It reeks of petrol. Expecting troops to march on them any day, the Red Shirts have filled their barricades with fuel, ready to burn their city down before they give it up. Under these conditions it was astonishing to see the tremendous courage and resilience of ordinary men and women: farmer’s boys, shop assistants, builders’ labourer’s and market women – all standing shoulder to shoulder in the face of bullets and armoured vehicles. This is the final answer to all the sceptics, cowards and traitors who doubt the ability of the working class to change society. Despite fearful odds, the Red Shirts stood firm, looking death straight in the eyes without flinching. An internet report by a Thai dissident living in London states: "The deputy chairman of the Bangkok Metropolitan Electricity Workers Union has brought people to join the Red Shirt protest at Rajprasong" --- Red Shirt leader just said that "We are like Spartacus!!!" Unfortunately, the same determination was not shown by the leadership. Some Red Shirt leaders indicated they would be prepared to return to the negotiating table, but only if troops were immediately withdrawn from the streets and the UN brought in to mediate: "We want the UN to moderate it because we do not trust anyone else. There is no group in Thailand that is neutral enough," said Nattawut Saikua, one of the main leaders of the protest. This was naïve in the extreme. The government treated the demand for UN intervention with contempt: "If they really want to talk, they should not set conditions like asking us to withdraw troops," Korbsak Sabhavasu, the Prime Minister's secretary-general, said. There was no real prospect of mediation. Behind this test of strength and willpower there is a clash between mutually exclusive interests. The government was determined to remove the protesters, and the latter were equally determined to stay where they were. Abhisit warned that his government would not “bow to demonstrators”, and the army would move to crush the protesters. Thailand’s foreign minister, Kasit Piromya, criticized foreign diplomats for even talking to the red shirts, who he called “terrorists”. This is the authentic voice of the Thai ruling class. It is the voice of a class that is prepared to go to the end in defence of its class privileges. But what of the leaders of the protest? From the beginning the leaders of the Red Shirts made repeated offers to negotiate with the government, all of which were rejected. The government understands what the leaders of the protest do not understand: that this movement poses a fundamental threat to the ruling class, which can only be met by the use of force. The rank and file was prepared to fight. But at the last minute the UDD leadership announced from the stage that they were giving themselves up to the police and ending the protest because they “cannot stand to see more deaths”. By showing weakness the leaders gave the green light to the army to attack, knowing that they would meet no resistance. This will have had a profoundly depressing effect on the mass movement. The same leaders who have been encouraging them to resist now tells them to surrender. Reports from Bangkok say that the rank and file women and men in the protest site are very angry about this. That is not surprising. The history of class struggle shows that it is better to go down to defeat fighting than to surrender without a fight. Police encircling Red Shirts. Photo by null0. The achievement of true democracy is not possible without the overthrow of the oligarchy. But the overthrow of the oligarchy is not possible without the overthrow of the Thai monarchy. King Bhumibol Adulyadej is 82 and in poor health. But he is a rallying-point for all the forces of reaction. The International Marxist Tendency expresses its firm support for the revolutionary movement of the Thai masses. We stand for the immediate resignation of the Abhisit government and the holding of free and democratic elections. We defend all democratic rights, and above all the right of the people to organize, to protest and to strike. In order to guarantee these rights we demand the calling of a constituent assembly to elaborate a genuinely democratic constitution, the first point of which must be the abolition of the monarchy. It is said that the Thai monarchy is a venerable institution, sanctified by religion and the power of an age-old tradition. But that could also have been said of the Romanov dynasty in tsarist Russia. But it only took one bloody clash on the ninth of January 1905 for all the old monarchist prejudices to be swept from the minds of the Russian people. Whatever the immediate result of the present bloody clashes on the streets of Bangkok, they will have the same effect. The burning hatred of the government of the rich will inevitably be transferred to that bulwark of privilege, the monarchy. The demand for a Republic will grow, uniting broad layers of the masses. And with each step forward the masses take, it will become clear that the only way forward is through a government of workers and poor farmers. As in all countries, so in Thailand, the institution of monarchy is not merely a meaningless survival of the past, a colourful but essentially meaningless anachronism, something for the tourists to admire. It is a bulwark of reaction, a symbol of property, power, wealth and privilege, a rallying point for all the forces of the counter-revolution. It must be swept aside if the revolution is to advance. As we write these words, the fate of the mass protest movement in Bangkok is being settled. Given the capitulation of the leadership, it seems likely that the first round will end in a defeat. But this explosion of the class struggle will have profound consequences. Thailand will never be the same again. Whatever government emerges from a chaotic situation will be inherently unstable. No lasting settlement is possible on the present basis. New upheavals are inevitable. The revolutionary democratic movement has been filled with class content. It will inevitably go beyond the bounds initially set by the leadership. It is in the interest of the Thai working class to fight for the most advanced democratic demands. Only by clearing away all the old feudal rubbish can the workers achieve the necessary conditions for developing the class struggle. But the workers will fight for democracy with their own class weapons: it is necessary to call a general strike to bring down the government! A general strike, organized through action committees, is the only way to disorganize the counter-revolutionary forces and to give organizational form and cohesion to the revolutionary movement of the masses. The conquest of democracy would require the complete revolutionary reconstruction of Thai society from top to bottom. And this aim can only be achieved when the working class places itself at the head of society to overthrow the hated oligarchy, following the example of the Russian workers and peasants in 1917.